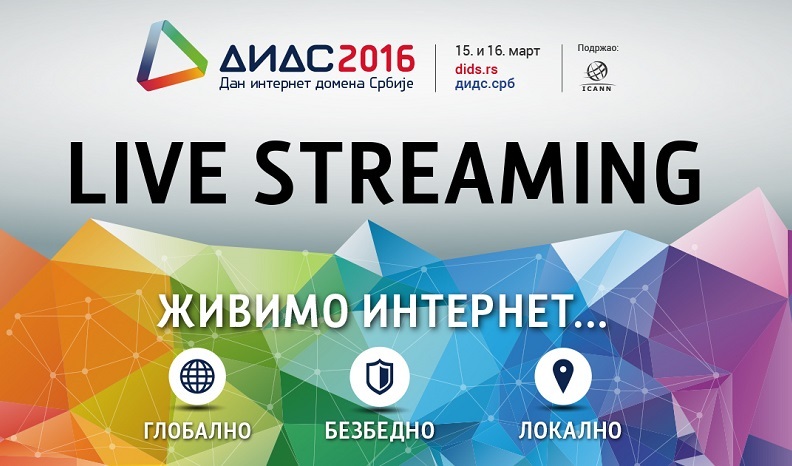 More than 500 visitors have registered for DIDS 2016, the seventh annual conference devoted to the development of the Internet globally and on the .RS and .СРБ domains in Serbia. This year’s Serbian Internet Domain Day will be held on 15th and 16th March at the Hyatt Regency Beograd hotel under the slogan Living the Internet… Globally – Securely – Locally. Those who cannot attend in person will be able to follow the DIDS programme online, primarily at dids.rs, but also via the RNIDS site and on several other sites belonging to our media sponsors: RTS, B92, Politika, Južne Vesti, LiveTV.rs, Netokracija, ITdogadjaji.com, Tajmlajn and MarketingITD.com. Online streaming of DIDS begins at 10:00 AM and will last until 3:30 PM. We invite all the interested public to join the discussion and share comments and questions using the #DIDS2016 hashtag on Twitter. Here you may find more information about the DIDS 2016 programme and speakers.